PONTE VEDRA BEACH, Fla. (AP) Eddie Pepperell makes his Masters debut this year, and he looks forward to seeing Augusta National so much that he plans to see it for the first time on Sunday, four days before it begins. "I don't like being at golf tournaments too long," said the 28-year-old from England. "In fact, I hate being at golf tournaments too long. I like to get in on a Tuesday." He played Bay Hill for the first time and had nine holes of practice. He never saw the front nine until the opening round. He played one practice round ahead of the British Open last summer, though he has played Carnoustie plenty during the Dunhill Links. He made his U.S. Open debut in 2017 at Erin Hills and played nine holes in practice and tied for 16th. There is a method to what others might consider madness. "Historically, whenever I've been at courses a long time, come Thursday I can be de-motivated," Pepperell said. "I don't want to work my (tail) off too hard on Monday through Wednesday. That represents you're lost. I don't want to be lost. That always represented a sign of struggle for me." Pepperell is more interested in being technically sound. "Most courses are in front of you, require good shot-making and skill," he said. "It doesn't matter how well I know a golf course. If I'm struggling with technique, I ain't going to go out there and beat these guys." Or perhaps there's another reason. "Maybe," he said with a smile, "people have just got more energy than me." PGA Tour players have something to cheer when it comes to the U.S. Open. For the first time since 2011, any player winning multiple PGA Tour events since last year's U.S. Open is exempt from qualifying, provided those events awarded full FedEx Cup points. Matt Kuchar became the first player to be exempt for Pebble Beach because of his victories at the Mayakoba Classic and Sony Open (though he has moved up high enough in the world ranking he would have been exempt, anyway). The USGA used to exempt multiple winners until 2012, when it adjusted its criteria to exempt the top 60 in the world instead of the top 50. That became a sticking point last year when Patton Kizzire won the Mayakoba Classic and the Sony Open. He went from No. 236 to No. 119 with his Mayakoba victory, and then from No. 105 to No. 54 with his Sony Open victory. But at the cutoff for the top 60 to be exempt, Kizzire had missed four straight cuts (and six out of 10 since his Sony Open victory) and dropped out of the top 60. He then missed 36-hole sectional qualifying by one shot. The schedule change hit home for Adam Scott when he realized that five of his next seven tournaments were major events, which began with The Players Championship. That means between the Masters in April and the British Open in July, he is playing only two regular PGA Tour events. One of them is the Memorial. The other is the Zurich Classic. Scott has never played the Zurich Classic, and it won't count toward his requirement of playing something new because he already played at Torrey Pines. His partner is Jason Day, and therein lies the reason. "I think we're playing it more with the Presidents Cup in mind and things like that, trying to get some reps in with Jason and prove we're a good pairing," Scott said. "It shouldn't be a secret that we should probably play together in Australia." The Presidents Cup goes back to Royal Melbourne in December. Scott said International captain Ernie Els wants his players in New Orleans because the Zurich is a team event (two days of fourballs, two days of foursomes). Of course, the Zurich Classic does not offer world ranking points, so there's no chance of moving up in the standings. Scott currently is No. 9. The top eight automatically qualify. "If I don't qualify," Scott said with a grin, "I'll say that's because I played Zurich, so you've got to pick me." Patrick Reed believes his game and his attitude are in a better place now than a year ago as he prepares to defend his title next month in the Masters. He wouldn't mind seeing some results to back that up. Reed has not finished among the top 10 on American soil since he was fourth in the U.S. Open last summer. He tied for ninth in Germany, tied for seventh in Shanghai and was a runner-up in Dubai late last year on the European Tour. He started slowly last year, too, until the month before the Masters when Reed was runner-up at the Valspar Championship, tied for seventh at the Arnold Palmer Invitational and reached the quarterfinals of the Match Play. "The preparation has been going really well," Reed said on a conference call Monday night. "I feel like I'm in as good a form, if not a better place, than I was last year at this time. The big thing is just to continue to build and grow on the things that we've been working on ... and just get ready and kind of get in playing shape for the tournaments upcoming." 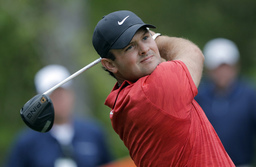 Reed is playing at Innisbrook this week, followed by Match Play before heading to Augusta National. In seven tournaments this year, he has not finished closer than nine shots off the lead, and his average finish is 14.5 shots out of the lead. Two days after Matt Fitzpatrick was runner-up at Bay Hill, the 24-year-old from England accepted special temporary membership on the PGA Tour. That means he can accept unlimited sponsor exemptions the rest of the season and would appear to be a lock for a full card next season. A year ago, he also had temporary membership but fell short of the equivalent to No. 125 in the FedEx Cup. Fitzpatrick is No. 34 in the world, making him the highest-ranked player who is not a PGA Tour member. Matt Wallace and Eddie Pepperell are right behind him in the ranking, and both are about 75 points shy of special temporary membership. Pepperell doesn't sound interested in coming to America. "I have no ambition to play the PGA Tour," he said in Mexico City. Rory McIlroy has posted 23 out of 24 rounds at par or better in his six PGA Tour events this year. His highest score has been a 72. ... FOX Sports plans 38 hours of live coverage from the U.S. Open at Pebble Beach - 10 hours each of the opening three rounds and eight hours on Sunday. Coverage ends at 10 p.m. EDT on the weekend. ... The Senior British Open will be held at Sunningdale in 2020. ... The LPGA Tour returns to America this week with the Bank of Hope Founders Cup, the first of three straight weeks culminating with its first major of the year at the ANA Inspiration. Dustin Johnson was the first player since 1994 to shoot all four rounds in the 60s at The Players Championship and not win. "I didn't think getting to No. 1 in the world would mean as much to me until the fact I haven't had it in a while. It gets under my skin more than I thought it would now that I had it." - Justin Thomas, who reached No. 1 for a month last May. He now is No. 5.